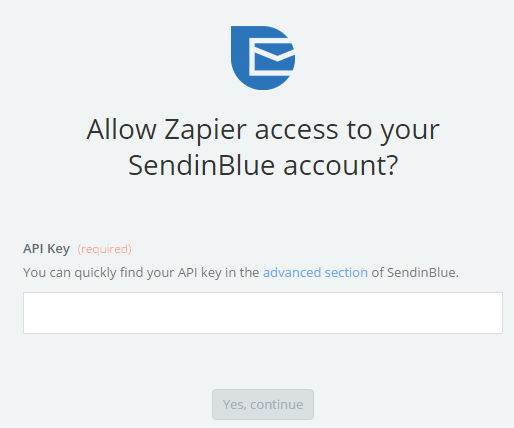 Zapier allows you to easily integrate the apps you use with your SendinBlue account. In this tutorial, we’ll show you how to use Zapier to integrate an app with SendinBlue, using Google Sheets as an example. 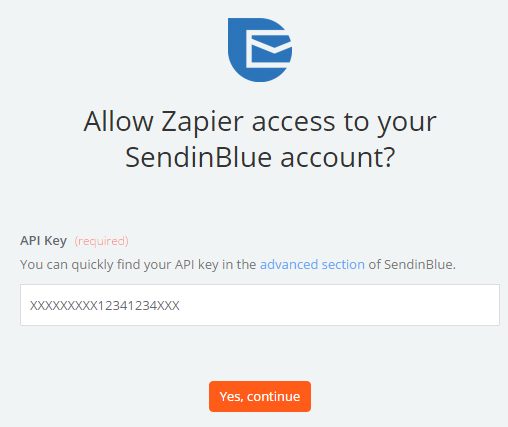 To integrate SendinBlue with a service using Zapier, log onto your Zapier account or subscribe here. To create a link between SendinBlue and an app, you need to "create a zap" by clicking on the "Make a Zap!" button in the header of a Zapier page. To add new contacts from another app to SendinBlue, you must first select the app. If you want to import your new SendinBlue contacts into the app, start by creating a link with SendinBlue. In this tutorial, we are going to talk about the first option: importing new contacts from an app into your SendinBlue account. First, select the required app (in this case we are using Google Sheets, a Google app). Follow the steps to connect your Google Sheets account or other app to Zapier. Choose a trigger for the app in question. Triggers are the actions you would like to be carried out, usually adding a contact to the app. Then follow the steps to configure this app in Zapier. Once the first app has been configured in Zapier, you just have to create the Zapier link to SendinBlue. First of all, you’ll be asked to select the action you would like to carry out with SendinBlue. Here you can only "Add a new subscriber". Just click on the action, then confirm by clicking on "Save + Continue". You will then be asked to enter your API key. To get your API key you must first log onto your SendinBlue account and go to My Account by clicking on the menu at the top right of SendinBlue. Then go to the page "SMTP & API". Select the API key "v2 & Plugins". Select and copy the API key and enter it into Zapier. You must then select the SendinBlue contact list into which you will import new contacts from the app. Next, select the app’s "email" attribute by clicking on the tab to the right of the Email box. You can add additional attributes if you wish (e.g. Name, First Name, etc.). After mapping the fields, check the test samples to make sure that the data is consistent with the selected attributes. Then click on the "Continue" button. Choose a name for your "Zap" and confirm by clicking on the "Turn Zap On" button. And that’s it! All the new contacts added to your Google Spreadsheet page are automatically imported into your SendinBlue account. Zapier allows you to link SendinBlue to all of the services available in Zapier.